Tokyo Sinfonietta was founded in l994 for the purpose of performing postwar music and of being actively involved in the creation of contemporary works. It has since organized subscription concerts in Tokyo, participated in a number of music festivals and toured France and Germany in l996, Germany in l998, Spain in 2001, Germany in 2004, as well as Venezuela in 2005. Through these activities, it has performed works by more than 40 composers from both Japan and abroad, including the Japanese premieres of Ligeti's "Humburger Concerto", Carter's "Asko Concerto", Xenakis's "Jalons", Benjamin's "At First Light", Lindberg's "UR", Murail's "Disintegrations", and Ades's "Living Toys". Tokyo Sinfonietta has given world premieres of works by Jo Kondo, Ichiro Nodaira, Misato Mochizuki,Jose Manuel Ropez Ropez, George Benjamin, Mark Anthony Turnage, Jonathan Cole, Marc-Andre Dalvavie, Jean Louis Agobet, others. This is an ensemble specially formed to meet the demanding requirements made by contemporary composers, and its feature is the deep understanding of music created and performed today. The members are select soloists also who are blessed with outstanding skills and insight. They give Tokyo Sinfonietta the kind of versatility needed to cover a wide range of music from the works written for a small ensemble to a larger chamber orchestra. 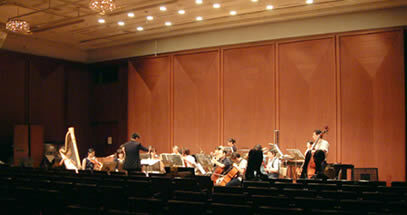 Tokyo Sinfonietta consists of 27 members (2-2-2-1-2-2-1-1, piano, harp, 3 percussionists, and 3-2-2-2). 2002-2008 Tokyo Sinfonietta. All rights reserved.